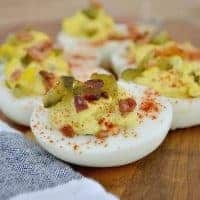 The best ever deviled eggs recipe made with sweet pickles, bacon and easy-to-peel hard boiled eggs. 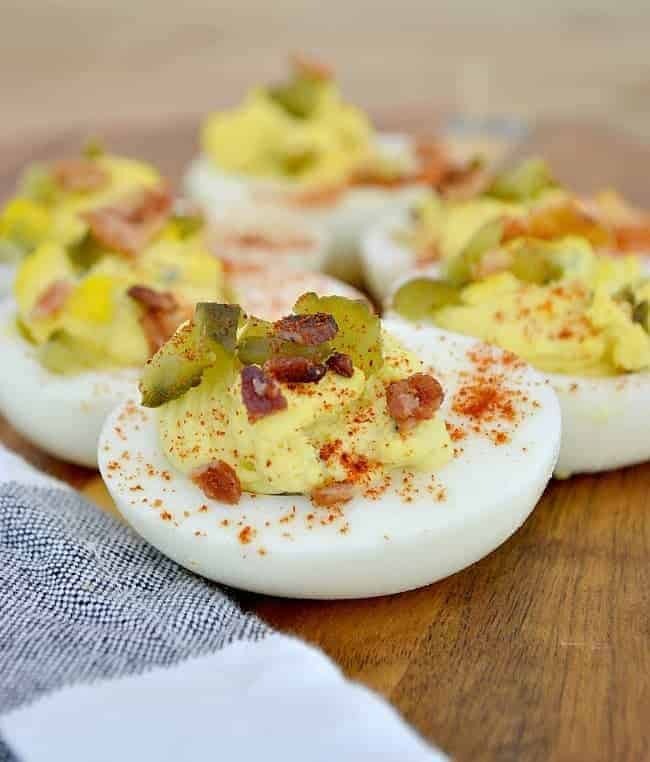 This is a favorite recipe of mine that I’ve been making for years for picnics, holidays or as a special treat for the hubs (just like the pickled eggs recipe that we’ve shared). Anyway, I’m excited to announce that I’ll be joining in on a new series with some of my favorite blogger friends. It’s all about recipes and each month we’ll all be sharing our take on different themes. This month’s theme is picnic recipes. Are you ready to get cookin’? 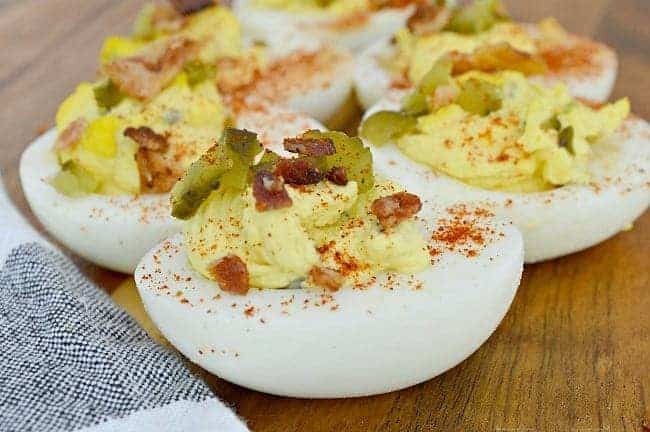 In my book, you can’t have a picnic without deviled eggs. They are, without a doubt, the perfect picnic food. They’re super easy to make, you can eat them with your hands and they’re totally delicious. This particular recipe is a group effort in our house. The hubs always makes the hard boiled eggs and I do the rest. It seems like he’s always trying to perfect his method but his current way seems to work quite well. 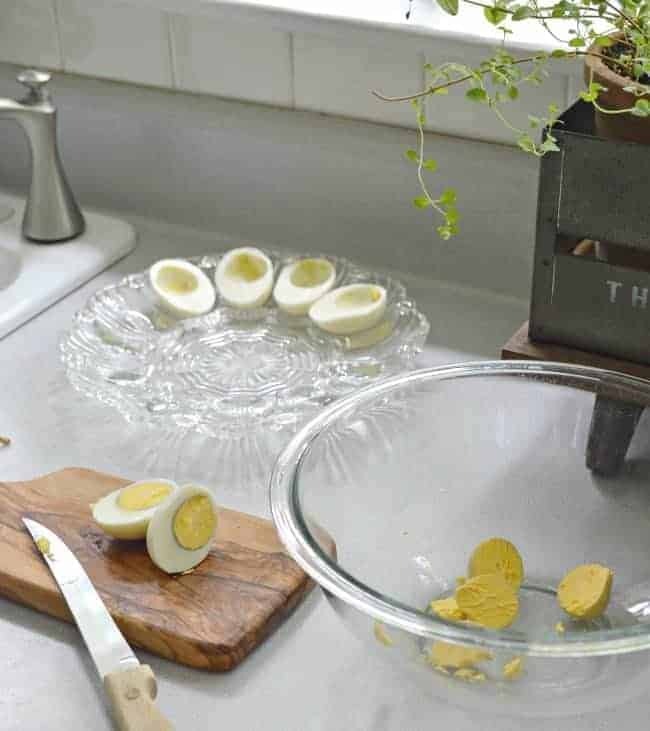 Perfect hard boiled eggs that are so easy to peel. Once the water boils, quickly add your eggs and boil for 15 minutes. Remove from heat, pour water out and peel eggs under a stream of cold water. Caution: the eggs are very hot but you must peel them while they’re hot. Voila! The perfect hard boiled egg! After your eggs are peeled it’s a good idea to put them in the fridge to cool them off. This makes them easier to work with. Once they’re cool, we can start creating our delicious picnic treat. This is where the hubs hands the baton, errr…spatula, off to me. I start by slicing the eggs in half and removing the yolks into a large mixing bowl. See that dark ring around the yolk of the egg on the cutting board? That means it cooked a little too long. It doesn’t look appetizing but it’s totally harmless and still makes a delish deviled egg. After all the yolks are removed I add all of my ingredients (mayonnaise, mustard, sweet pickles, salt and pepper). These definitely are the perfect picnic treat but we also love them during the holidays and they’re always a hit at parties. The recipe card is at the bottom of the post, and don’t forget to pin the post for later. So tell me, what’s your trick for making the perfect hard boiled egg? Don’t forget to check out the rest of The Cooking Housewives and their picnic recipes. Maybe you’ll find that perfect one for your next get-together. The best ever deviled eggs recipe. The perfect picnic food. Take eggs out and peel under a cold stream of water. Caution! Eggs will be hot but you need to peel them when they're hot. Place peeled eggs in a bowl and refrigerate for a few hours, to cool. Take cooled eggs and cut in half. Put yolks in large mixing bowl. Cut up sweet pickles into a fine dice (brunoise). After all the egg yolks are removed, add all ingredients except paprika and bacon into mixing bowl. Spoon mixture into a baggie, cut off corner with scissors. Dice cooked bacon and 5 sweet pickles. Sprinkle bacon, pickles and a small pinch of paprika on each egg half. These sound so good! 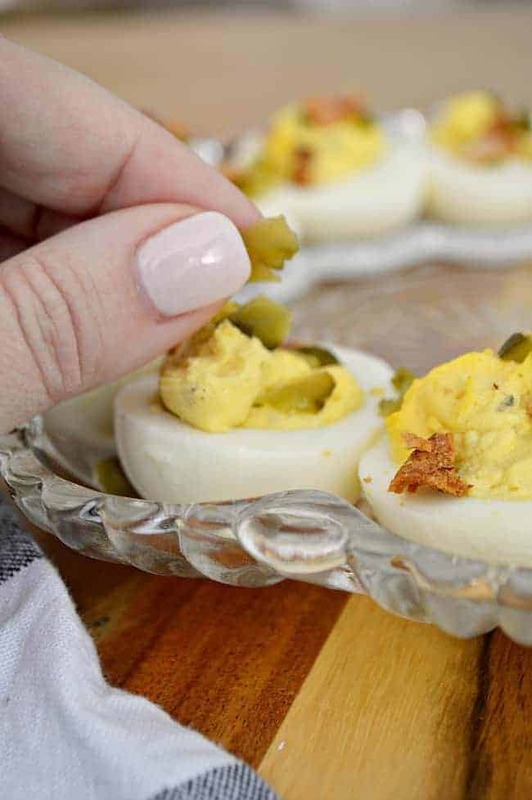 When I was growing up, if someone served deviled eggs I thought they were soooo fancy, and I always had at least one. I’ll have to try this recipe the next time I make some for my guys. I love hard boiled eggs ours is a similar recipe, try both kinds of mustard,thanks for this picture and now i am going to fix me some, made me hungry,lol!! Thanks so much Marlene. They all do look yummy, don’t they? Hope you have a great weekend! Thanks for this recipe. 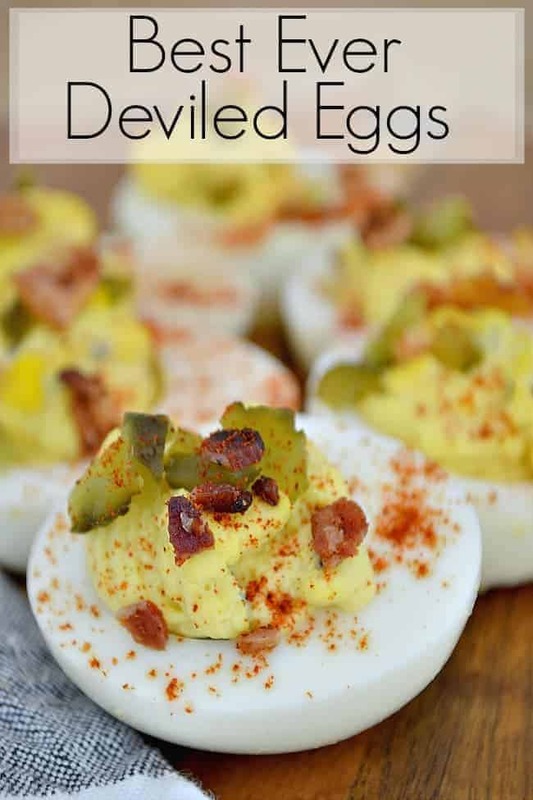 I love deviled eggs but I’ve never made them with relish so I’ll have to try them. that I’m over the moon about. You can google how to do it if you have an Instant pot, but if you don’t just use a steam basket in a regular pan, bring the water (below the basket) to a boil, add the eggs, put on a lid, steam for 10 minutes, then immediately put the eggs in a big bowl with water and ice cubes. When the eggs are cool, the shells just fall come off with no sticking shells. It’s amazing. I am loving your blog. I found you from Rhoda at Southern Hospitality and I’m glad I did. I love your decorating, your trailer build and your recipes. Keep up the good blogs. Hi Jean. Thanks so much for the tip on steaming the eggs. We’re always willing to try a new way of hard boiling, so we’ll definitely give it a try. I’m so glad that you found us and that you’re enjoying our blog and projects. I think you are right that everyone thinks they have the “best” ever Deviled Egg recipe. My sons would say that my recipe is the best ever. I got the recipe years ago on the back of a Russian dressing bottle. Basically, it’s 12 eggs boiled, scoop out yolks and add Russian dressing. Now in our area, I can’t find Russian dressing anymore so I use Thousand Island dressing and no one is the wiser. I have brought the eggs to events and my mind are scoffed up immediately, even when there are other Deviled Eggs available. LOL It’s so easy, but tastes so good. One problem I can only eat one or two because I can’t eat eggs without having very severe intestinal pain. Kind of a bummer. I can’t even eat scrambled eggs. It’s the yolks that bother me. 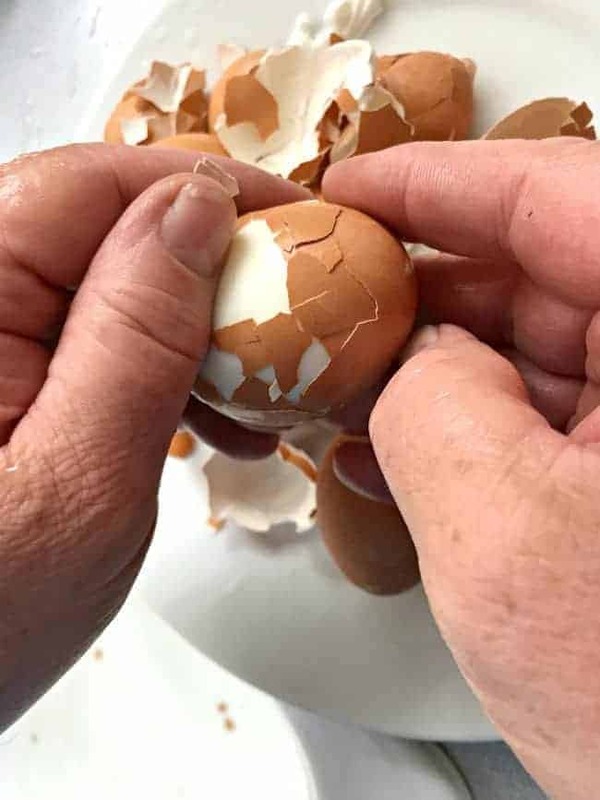 Anyway, I learned a trick to peeling the eggs. Once you drain the hot water, fill the pot with cold water and knock the eggs around a bit. The cold water will get under the cracks and lifts the shell for easy peeling. Thanks for sharing your recipe and your other friends’ recipes! I love Russian dressing so I’ll definitely give that a try, and the trick with the eggs. I think that my husband has tried just about every method but I’ll give him your tip. Thanks for that. That is a bummer about how egg yolks affect you. I’m not big on eggs, don’t eat a lot, but it’s never fun when you can’t eat something that you like. I don’t add salt to the water. Is that for taste? I boil for 10 minutes and then 10 minutes in cold water. I add sweet pickle relish to the egg mixture (my mom did this). Never thought of bacon on the top. Have to try it. I do the same when making egg salad.